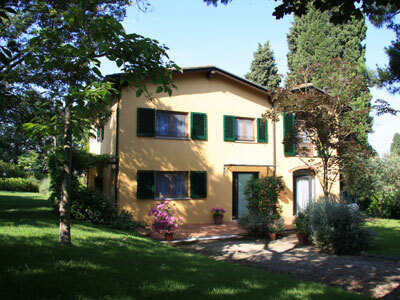 Casa Montecuccoli is a comfortable holiday house immersed in the charming hills of the Tuscan countryside, surrounded by century old cypress and olive trees. It is just a few kilometres from the small town of Montelupo Fiorentino, the centre of traditional antique ceramics. The location of the house offers the possibility of walks and bicycle rides through fields and splendid woods; you will enjoy a holiday of health, nature and sport. Casa Montecuccoli is located in the tuscan countryside, on a hill in Montelupo Fiorentino, just few kilometres far from Florence and it's surrounded by groves.